Rinsing nozzle sprays water inside bottle, then the table continues to rotate so that water drips from bottle before being removed by operator. Water jet operated by bottle itself (no bottle, no spraying), and can be adjusted for different bottle specs. 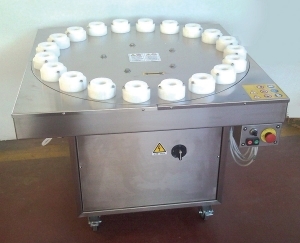 Designed to clean & rinse powder and other small particles from the interior of bottles prior to filling. 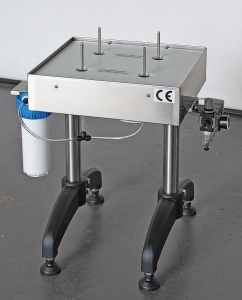 The TPD and TPR Rinsers also sterilize, sanitize and rinse the interior of bottles or jars. 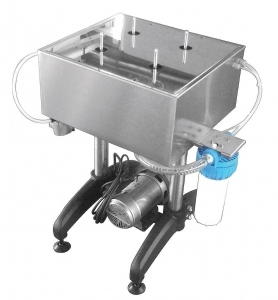 Designed to sterilize and rinse bottles or jars. Can be used with a sterilizing product or alcohol-based solution, which is recycled after using. For wine, can be used with a solution of wine and SO2. Rinsing jet operated by bottle itself, (no bottle, no spraying).